I spent a week enjoying the food and atmosphere of the French Quarter in New Orleans last month. The company my girlfriend works for was hosting a conference at the Roosevelt Hotel and allowed me to join her. They were kind enough to cover the hotel expenses, which left me with a relatively inexpensive vacation only having to pay for my flight down there and food. Because my girlfriend was stuck in a conference during the day throughout the week I was left to myself to explore the French Quarter. Because of the injury to my leg, I was limited as to the extent of what kind of adventurous activities I could delve into, so I compensated by being adventurous with trying new food in between lounging at the pool and working out in the hotel’s fitness center. It was the first time I got to try a variety of food including Po Boys, Mufelatas, Gumbo, Jambalaya, Turtle Soup, Alligator Popcorn, Alligator Burger, Beignets, Craw Fish and even insects, if you can call insects food. Towards my last days in New Orleans I decided to visit the Audubon Aquarium and Audubon Insectarium. The Aquarium was a pleasant experience, but nothing worth noting. The real interesting exhibits were at the Insectarium. As I continued through the Insectarium I was bothered by my refusal to pet the roach. Don’t get me wrong, the thought absolutely disgusted me, but it was this tiny little thing that was harmless to me. As I was making my way through the final exhibits a girl around twelve who was part of a field trip came over to me and asked me if I wanted to eat a worm. I thought she must be talking about a gummy worm of some sort, but she told me it was a real worm. I asked her where she got a real worm from and she told me there was a place by the food court area that served them and then she proceeded to eat the worm. Her friend standing next to her looked mortified and that is when I realized that it was probably a real worm. Right before I was about to leave the Insectarium I stopped myself and decided that I was going to go pet that silly roach. That is exactly what I did. I can’t even tell you what the roach felt like I was so excited that I just did it; then I promptly went to the restroom and scrubbed my hands with soap and water. Since I was feeling adventurous I decided to look at the Insectarium map (for the first time) and saw that by the food area was an exhibit called “Bug Appetite”. 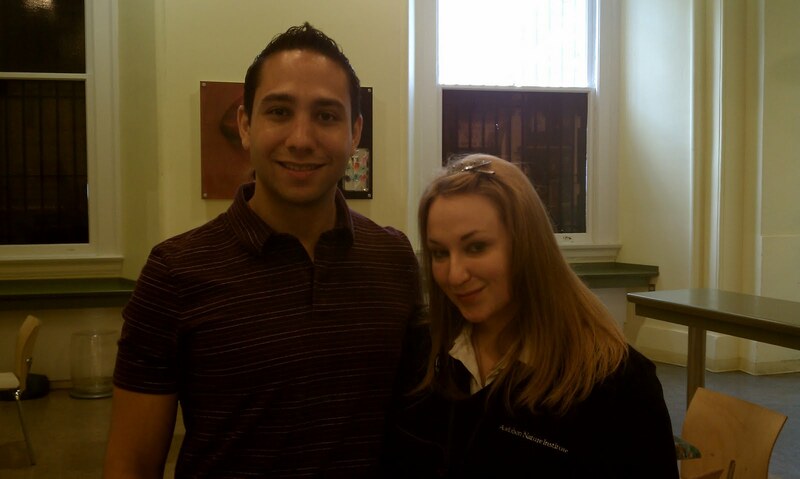 When I got there I was greeted by the girl manning the exhibit, her name was Elise. 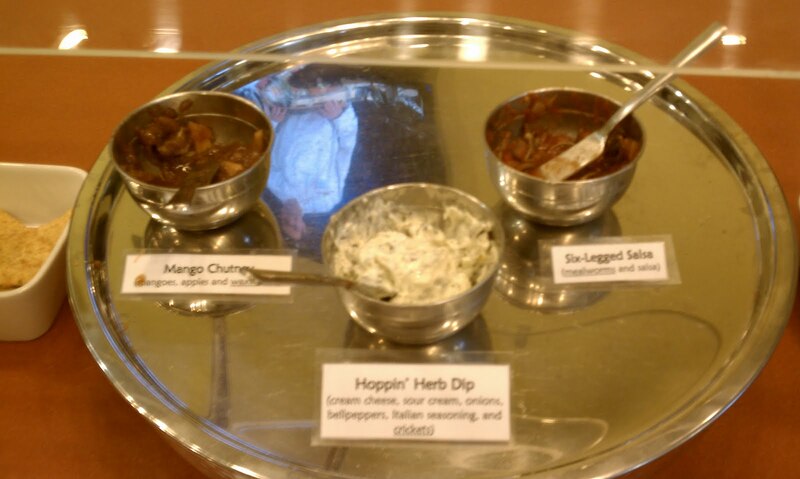 So basically the exhibit consisted of crickets, mealworms and waxworms coupled with different ingredients to mask the fact that you were eating bugs. 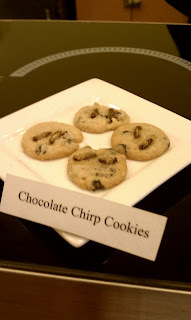 It took me a few minutes of talking to Elise before I took the plunge and tried the Chocolate Chirp Cookies. They weren’t bad, didn’t taste the actual cricket, but I could sure see them in the cookie. 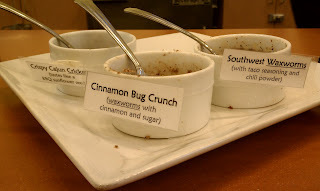 I then tried each one of the Crispy Cajun Cricket, Cinnamon Bug Crunch and Southwest Waxworms. 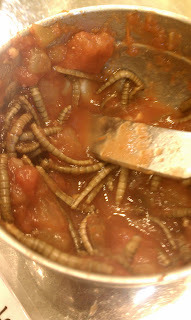 The Southwest Waxworms actually tasted like Andy Carp Hot Fries.